The Big Score: This one is so obscure there's not a single review for it on the IMDB! 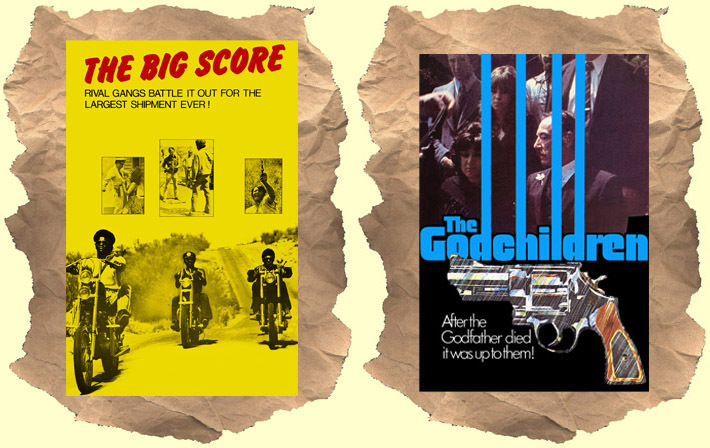 Despite the blaxploitation / biker looking poster art this is actually a film about drug smuggling. But really there's a little bit of everything in this one. Basically, it's about a group of guys who find out about a ton of grass that's just waiting to be snuck over the border. For a very reasonable fee the whereabouts of the grass is revealed to the men and they hatch a plan to get it to the U.S. via a hot air balloon. Meanwhile, a 70's black biker gang was also sold the information about the drugs and they don't plan on being screwed over. Along the way there's a long-haired rock band playing on a truck, Doodles Weaver, an extended Nazi rally fantasy / hallucination, crooked cops, shoot-outs, hippies wandering the desert, a jailbreak and of course lots of pot smoking. A one-of-a-kind 70's rarity that you've never even heard of! The Godchildren: Here's a real obscurity! It's exploitation fun wallowing in the world of drug dealing, loose women, organized crime, torture, double crosses and more. Complications arise in a lucrative scheme of running drugs between Los Angeles and Hawaii. The standout here is the unknown Lindsey Hillard as a cold hearted hitman. He's a little like Dennis Weaver in Touch of Evil crossed with Javier Bardem in No Country for Old Men! Worth checking out!